276 pages | 29 B/W Illus. Nonhuman animals are ubiquitous to our ‘human’ societies. Interdisciplinary human/animal research has - for 50 years - drawn attention to how animals are ever-present in what we think of as human spaces and cultures. Our societies are built with animals and through all kinds of multispecies interactions. From public spaces and laboratories to homes, farms and in the ‘wilderness’; human and nonhuman animals meet to make space and place together, through webs of power relations. However, the very spaces of these interactions are not mute or passive themselves. The spaces where species meet matter, and shape human/animal relations. This book takes as its starting point the relationship between place and human/animal interaction. It brings together the work of leading scholars in human/animal studies, from a variety of disciplinary and interdisciplinary backgrounds. 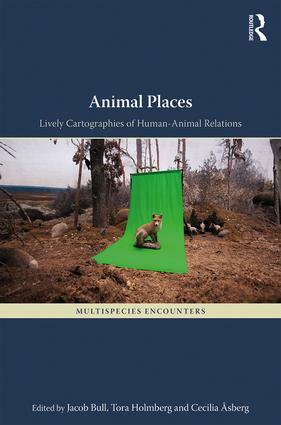 With a distinct focus on place, physical space and biocultural geography, the authors of this volume consider the ways in which space, human and nonhuman animals co-constitute each other, how they make spaces together, produce meaning around them, struggle over access, how these places are storied and how stories of spaces matter. Presenting studies thematically and including a variety of nonhuman creatures in a range of settings, this book delivers new understandings of the importance of nonhuman animals to understandings of place - and the role of places in shaping our interactions with nonhuman creatures. As pets, as laboratory animals, as exhibits, as parasites, as livestock, as quarry, as victims of disaster or objects of folklore, this book offers insights into human/animal intermingling at locales and settings of great relevance to many areas of research, including geography, sociology, science and technology studies, gender studies, history and anthropology. This book meets the evolving interest in human/animal interaction, anthrozoology, and the environmental humanities in relation to the research on space and place that currently informs the humanities and the social sciences. Jacob Bull is coordinator of the Humanimal research group at the Centre for Gender Research, Uppsala University, Sweden. He is the editor of Animal Movements – Moving Animals: Essays in Direction, Velocity and Agency in Humanimal Encounters and co-editor of Illdisciplined Gender: Engaging Questions of Nature/Culture and Transgressive Encounters. Tora Holmberg is Professor of Sociology, Uppsala University, Sweden. With a cultural sociology approach, her studies and publications combined Animal Studies with STS (Science and Technology Studies) and feminist theory. Holmberg's books include Urban Animals. Crowding in ZooCities (Routledge 2015). She is research leader for the Cultural Matters group, Uppsala, and Chair of the Swedish Sociological Association. Cecilia Åsberg is Professor of Gender, nature, culture at Linköping University, Sweden, and founding director of the Posthumanities Hub and the Seed Box: an Environmental Humanities Collaboratory. She is the author and co-editor of several publications, including A Feminist Companion to the Posthumanities (Springer 2017, with Rosi Braidotti). Multispecies Encounters provides an interdisciplinary forum for the discussion, development and dissemination of research focused on encounters between members of different species. Re-evaluating our human relationships with other-than-human beings through an interrogation of the ’myth of human exceptionalism’ which has structured (and limited) social thought for so long, the series presents work including multi-species ethnography, animal geographies and more-than-human approaches to research, in order not only better to understand the human condition, but also to situate us holistically, as human animals, within the global ecosystems we share with countless other living beings. As such, the series expresses a commitment to the importance of giving balanced consideration to the experiences of all social actors involved in any given social interaction, with work advancing our theoretical knowledge and understanding of multi-species encounters and, where possible, exploring analytical frameworks which include ways or kinds of ’being’ other than the human.